Located in the center of Europe, Frankfurt am Main is the financial heart not only of Germany but also of the EU, as well as a major center for conventions and trade fairs. Visitors will find a vibrant social and cultural atmosphere, pleasant climate and alluring countryside. Advice: Beware of pick-pockets. Driving is difficult due to many one-way streets. Advice: Stay out of the Bahnhof Kaiserstrasse area. Advice: If you have time, visit the area called Taunus, the hills surrounding Frankfurt. http://www.germany-travel.net/ – for a good overview of Germany, and a few links to Frankfurt info, visit this site. 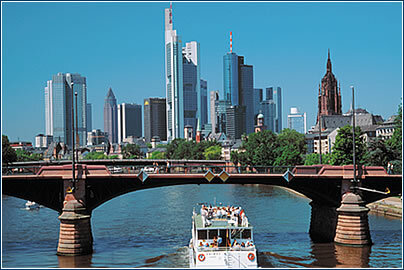 · Frankfurt ranks with New York, London and Tokyo as one of the world’s most important business cities. 42,000 businesses, generating more than EUR 46 billion GDP, are registered in the city. Manufacturing is the main sector, but high technology is increasingly important. 83% of the total workforce is employed in the service industry (the largest employer being the international airport). · The city is home to a number of key national and international financial organizations, and half of Germany’s largest banks also have their headquarters here. 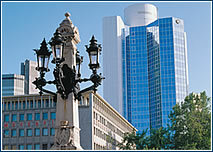 Home to 500 publishing and printing companies, Frankfurt is the mainstay of the German book industry. It is also a center for media and communications, with 2,000 companies involved in public relations and marketing, press, film, advertising and telecommunications. · Messe Frankfurt GmbH is one of the largest trade fair organizations, positioned west of the bank quarter and welcoming up to 44,000 exhibitors and 2.16 million visitors annually – the Book Fair alone attracts 8,000 exhibitors and 250,000 visitors. 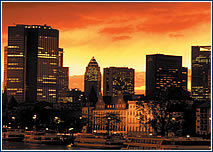 In addition, around 55,000 conferences and congresses are held annually at 72 venues in the city. · Punctuality for both business and social events is extremely important. Frankfurters are impressed with efficiency and strong business sense and this is displayed in their business style – firm handshakes, formal use of business cards, and an appreciation of straight talking. Business contacts must be addressed by their surname and by the formal ‘Sie’ for ‘you’. Academic and other titles should be used wherever applicable. Both men and women are expected to wear suits – men should also wear a tie. · Business socialising mainly takes place over lunches, especially on Friday, as many offices close at around 13:00. After work drinks are a more casual affair between colleagues and therefore seldom include clients. Visitors to Germany should note that in some cases, instead of applauding, German businessmen and women may rap their knuckles on the table.